Capsule Summary: The 4077th is forced to evacuate to a nearby cave due to heavy shelling and Hawkeye’s crippling claustrophobia is revealed. It’s nice every now and then to be reminded that the “M” in M*A*S*H stands for “Mobile” and that the 4077th was often forced to pack up and move due to shifting front lines and artillery fire. The novelty here is that bugging out to a new location wasn’t possible due to shelling from both sides so the 4077th had to go spelunking. Too bad so little of the episode actually takes place in the cave. To be honest, I’m not sure the episode needed Hawkeye to be claustrophobic. Aside from a few chuckles, it didn’t actually add much to the story. 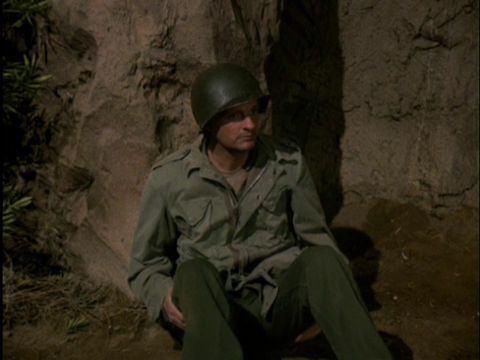 In fact, it may have been more interesting if Hawkeye had to overcome his fear of leaving the relative safety of the cave to go back to the 4077th to operate on Private Lovett. What if the doctors had to draw straws to decide who operated on Lovett? Or would that be too similar to the scene in “Aid Station” when everyone drew sausages? Margaret’s fear of loud noises doesn’t feel quite as out of place, in part because it can be traced back to earlier episodes, particularly “Comrades in Arms, Part 1” in Season 6. Sergeant Bartruff was too much. It’s one thing to depict military incompetence. 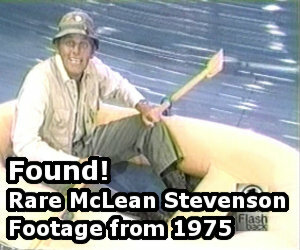 That’s par for the course with M*A*S*H. But Bartruff wasn’t incompetent. He was smarmy. He seemed happy to hear the 4077th might be in the wrong place and in danger. He didn’t appear concerned at all to learn the Army might be shelling a hospital. Hawkeye sits outside the cave. I sort of feel like something more should have happened with O’Malley, the wounded soldier who could identify artillery by its sound and thought up the crutch device. I wonder if there was another scene with him written or filmed and then cut. The cave looked pretty realistic even though I am 99% sure it was made out of 2x4s and papier-mache. I could have sworn this episode was featured in a spotlight already. Either way, it was apparently this episode which inspired the children’s book series, FRANKLIN: the story goes the original author was nursing her baby one night while watching this episode, and was intrigued by Hawkeye’s comment about, “Can you imagine me as a turtle? Afraid to go in my own shell? All the other turtles laughing at me in my underwear?” This served as the inspiration for one of the books in which Franklin is afraid of his own shell because he’s afraid of small dark places. The guy who played O’Malley (I forget his name at the moment) was clearly a character actor, as I’ve seen him in a few other things: he was the vet at the pound in the Disney movie HOMEWARD BOUND: THE INCREDIBLE JOURNEY, and he was also the man in the SEINFELD episode “The Hamptons,” who finked on Kramer for poaching lobster traps. O’Malley was played by actor Mark L. Taylor. I remembered him as soon as you mentioned the lobster traps from Seinfeld. He was a regular on Wayne Rogers’ sitcom “House Calls” as snotty hospital administrator Conrad Peckler. I also saw him at least once on “Home Improvement”, which only stood out to me because he was an actor named Mark [L.] Taylor on a sitcom with a character named Mark Taylor (Tim’s youngest son). A flat, boring episode in which the only memorable point is the throwaway revelation of Hawkeye’s claustrophobia. I neither like nor dislike this episode as there is nothing there to stir any emotion. I thought the claustrophobia plot point was another in a long line of let’s give Alan a chance for another Emmy episodes. I think part of the problem with the writing in the show is there are so many different writers who come and go and the tone and content of episodes changes. It seems like many of the people who write for the show didn’t take the time to read through all scripts to find out about the characters. Hawkeye’s issues always seem to derive from some latent mental health issues which is nice foreshadowing for the final episode. One little thing I noticed is when Father Mulcahy found out about Hawkeye’s claustrophobia he said “I’m working on the other side if you want to talk.” Then he gave an embarrassed look as though he was sorry his “office” was inside the cave. Why on Earth couldn’t he stay there and talk to Hawkeye? I’m thinking it was just to get a few lines out of William Christopher as per his contract.